Kohl applicators are called salai in Pashto. Use of kohl for protection of the eyes against blowing dust is at least 3000 years old, possibly older. Its cosmetic qualities are an added bonus. Kohl is usually finely ground antimony sulfide. Occasionally lead sulfide is used as an inferior substitute. It was and is used from Morocco to India. The typical kohl applicator from ancient times until today looks like a blunt ended straight pin from 2-5 inches (~3-7cm) long. From ancient times bronze has been a favorite metal. A web search for "kohl" & "kohl applicator" produced a number of references but nothing that could be considered reliable in terms of dating or attributing these objects. One site gave a picture of a bird head applicator, if maybe a bit short, combined with a tripod bottle of which it obviously was not the mate (different patina, different art), and an attribution to 8th c. BC Baktria which I considered completely thin air. 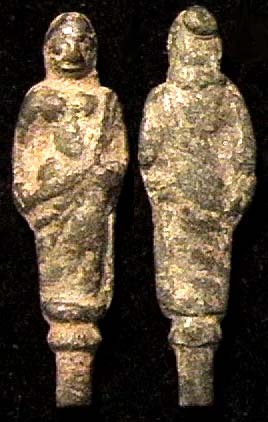 Another provided a picture of a "Luristani" piece. My experience is that calling something Luristani is usually another way of saying "I don't know." Bronze, ancient, eastern, call it Luri, who can contradict you with any authority, especially if there's a ram motif involved! And the prices they were asking were, oh, average 25 times what I'm asking. As if they're thinking "It's not selling anyway, might as well raise the price!" I am thus, finding myself for the moment completely alone in the ocean of ignorance about these things, going to make a series of guesses as to when they were made. So all of my attributions must be taken as absolutely provisional. Anyone who knows about these, please correct my errors. But I do know where they came from. All are from the general neighborhood of Swat, Northwest Frontier, Pakistan, where people find ancient objects lying on the ground, don't even have to dig. And laws - what are they? 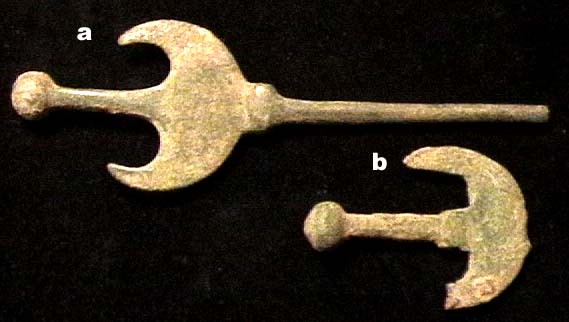 s5) GREEK - ISLAMIC, c. 300 BC - 1700 AD, bronze kohl applicators (salai). Actually I think these are probably ancient, possibly pre-Greek, but my basis for so thinking is mostly the type of patina/corrosion. The simplicity of the design doesn't give much to go on. 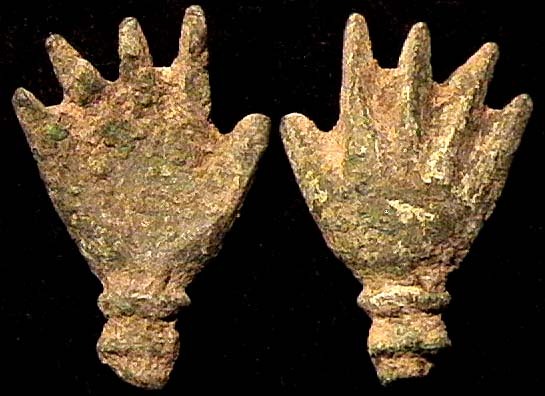 s7) HEPHTHALITE-SHAHI?, c. 400-1000 AD?, bronze kohl applicator (salai), 29x24mm head is like a trident, central tine elongated with a round knob on the end. This would appear to be a strongly Hindu motif. 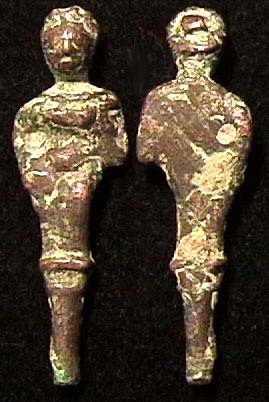 Some bronze kohl applicators (salai) with bird figure head. 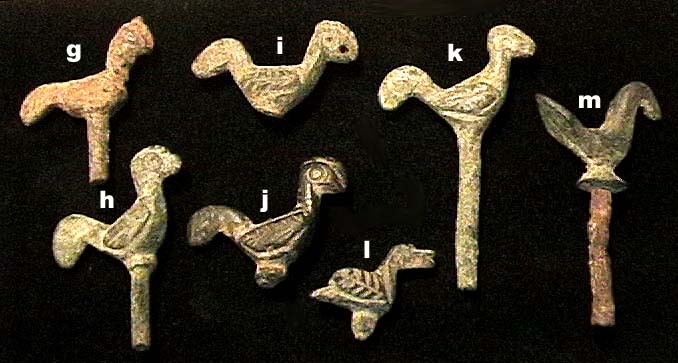 Birds seem to be the most common motif for this and similar objects. I have no trustworthy references for them. When I asked my supplier I got no useful information. I had thought for a while that they were early Islamic, as much from the frequency of occurrence as anything else, but that was just an educated guess. Now I have 2 bird topped jar lids (see below) that actually seem to have some features that remind me of ancient Indus and Baluchi culture. 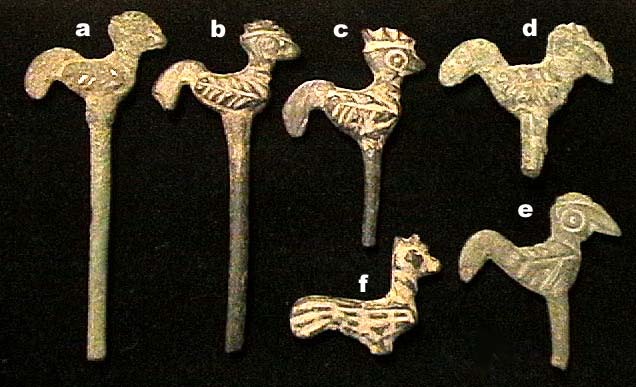 I have since seen small metal bird things definitively attributed to Indus, and I have seen others with Arabic writing on them, so it is clear that the same motif was used in the region over a period of 2 millennia. The next groups form a category based on decoration - simple linear incisions, and patina - mostly smooth and black. I tend towards Islamic as an attribution, possibly 1000-1600 AD. s14) These are double ended, square profile handle in middle. Hygienic concept - one side for each eye.